Almost 30% of new doctors are consumed by a secret worry that they are fakes and failures. How one doctor broke the silence around his own feelings of inadequacy and shame — and is now helping others understand imposter syndrome. As soon as I hung up the phone, my head spun with anxiety and self-doubt. I’d just been notified that I was deploying to provide medical support to U.S. military special operations missions in Africa. In addition to fear of the unknown, I was immediately worried about my skills and wondered why I was chosen for this important job. Certainly there were better candidates. Even though I was a competent Air Force family medicine physician, I viewed myself as wholly inappropriate for this assignment. And I already began envisioning myself as inferior to the surgeons and trauma specialists who would eventually surround me. I was suffering, as I have before, from imposter syndrome. Imposter syndrome is self-doubt driven by an inability to internalize one’s achievements and abilities. Sometimes, it’s sparked by a new challenge or sudden setback. More often, though, it’s a nagging, ongoing suspicion of inadequacy despite all external signs to the contrary. Victims of imposter syndrome often dismiss their success as stemming from luck or from working extremely hard to compensate for shortcomings — and they live in fear of being exposed as frauds. Many in medicine suffer the pain of imposter syndrome. In one study of residents, approximately 30% indicated feeling like imposters, and in another, 49% of female and 24% of male medical students did. And it occurs even among those at an advanced stage of their careers. What's more, imposter syndrome matters: It’s correlated with depression, anxiety, and burnout. Increasingly, the medical community is recognizing that it is impossible to discuss the well-being of learners and physicians without examining this part of the puzzle. Talking about imposter syndrome is difficult enough. Even more challenging can be sharing the intense feelings of shame that often inflame imposter syndrome. Shame is a painful emotion that typically occurs in response to a triggering event — making a medical error, for example. Rather than seeing the setback as resulting from a specific circumstance or action, the person instead blames a fundamentally, globally flawed self. Our research shows that shame is associated with a host of negative outcomes in medical learners, including diminished empathy, physical health, and psychological wellness. The relationship between shame and imposter syndrome hasn’t been well studied, but the feelings of being fundamentally flawed that underlie both make them very difficult to talk about. What’s more, people who suffer from shame and imposter syndrome often believe they are the only ones who do so, amplifying the isolation and stigma — and making sharing harder still. The culture of medical education makes these conversations even more difficult. 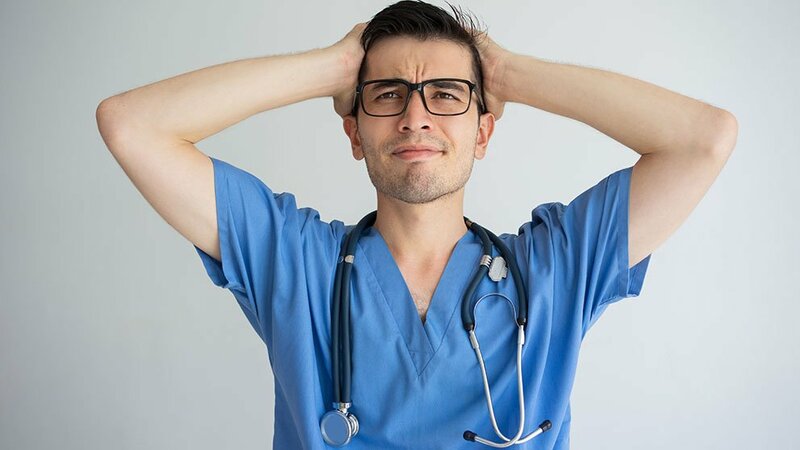 Medical students and residents often feel compelled to impress peers, ensure instructors' positive evaluations, and maintain an obligatory “thick skin.” Sometimes, they model a tough exterior after practitioners who may have trained at a time when intentional shaming was considered a necessary teaching tactic. Unfortunately, that pedagogical strategy continues to plague some corners of medical education today. To proactively confront shame and imposter syndrome, we need to break the silence surrounding them. In that spirit, let me share more of my story. One day during my predeployment trauma refresher, I passed up an opportunity to practice an exam on a trauma patient because I thought another provider was already doing it. Clearly annoyed (or maybe even disgusted), the resident supervising me brusquely brushed me aside to do the exam herself. In response to this seemingly minor event, I felt intense shame and viewed myself as an incompetent and unassertive doctor. And I was sure that the resident and the medical students in the room were judging me as the pathetic failure I perceived myself to be. Over the next few hours, my shame spiraled. Emotionally off-kilter, I made several rookie mistakes when scrubbing for surgery: I forgot to remove my wedding ring; I put on the gown incorrectly; and I slowed the start of the case, much to the annoyance of everyone in the room. In the three-hour operation that followed, I was painfully, hyper-aware of my every move, wholly unsure of myself, completely silent, and utterly disengaged from learning. I realized that much of my emotional discomfort was driven by an intimidating learning environment, uncomfortable learning curves, and fear of the unknown, none of which implicated me as a person. Over the following days, my escalating self-doubt and self-blame did to me what shame does best. It caused me to withdraw from learning opportunities, isolate myself, and feel depressed. It caused me to question who I was not only as a doctor but as a person. I did a few things to proactively engage with my shame and recover. For one, I wrote down exactly how I was feeling and what was driving my shame. Funneling intrusive and emotionally overwhelming ruminations into concrete observations and facts allowed me to analyze the situation more accurately. I realized that much of my emotional discomfort was driven by an intimidating learning environment, uncomfortable learning curves, and fear of the unknown, none of which implicated me as a person. Next, I talked to my wife. She offered love and support and reminded me that my self-worth is dependent on far more than my performance at work. Opening up and talking about my shame was by far the most important step to recovering. Finally, armed with intact self-esteem and an ability to self-assess more accurately, I focused on the specific things I could improve such as my assertiveness and attention to detail, and I practiced greater self-compassion. In doing so, I shifted my painful experience to a growth opportunity, and I successfully completed the trauma course and my deployment in a capable, engaged, and resilient manner. For me and for others like me, sharing our stories is critical to the process of healing from shame. Sharing is essential for many reasons. For one, shame is a common and normal human emotion, and there is power in that fact. As sociologist Brené Brown has famously asserted, “Shame cannot survive being spoken,” and openly discussing shame and imposter syndrome can build connection and community. What's more, I strongly believe that efforts to reduce burnout, depression, and suicidality in medicine will fall short if we fail to express and address the deeper emotions that may underlie them. We need to create safe learning environments that encourage authentic displays of emotion and must treat individuals who share honestly with acceptance and respect. In addition to sufferers bravely stepping forward to share, we must work to change the surrounding culture. We need to create safe learning environments that encourage authentic displays of emotion and must treat individuals who share honestly with acceptance and respect. We also need to prepare faculty members to provide learners and colleagues with active, empathic support. It’s also essential to research and better characterize shame and imposter syndrome. Doing so will help us to identify and discuss them more effectively and to build tools that support resilient approaches to teaching and practicing medicine. Rather than punishing mistakes, we need to treat them as learning opportunities, and we need to provide trainees with feedback in ways that help them accept the inherent discomforts of learning. And to address the hierarchical forces that can drive emotional disconnection, we need to ask for greater vulnerability from those at the top of our institutions. Perhaps above all, though, we need to treat ourselves with the same love, compassion, and empathy that we provide our patients. William Bynum, MD, is an assistant professor of family medicine at Duke University School of Medicine and associate program director of the Duke Family Medicine Residency Program.